The Great Forest, which surrounds the River Territories. Notes: â€¢ Squares are called positions. River positions can also be called bridges. â€¢ The algebraic notation of the board is: files are designated A to I (West to East) and ranks are designated 1 to 10 (South to North). â€¢ The Combatants initially occupy the same positions as their counterparts in Chinese Chess and so this deployment is called the "Xiangqi set-up". Wing is a battle between the two Territories known as the Northern Territory and the Southern Territory (together they are called the River Territories). The respective Empresses of these two Territories have long disputed rights over the river that runs between their Territories and finally they have resorted to armed combat in order to resolve the dispute. The river is claimed to have healing properties and has many bridges along it and so can be occupied at any part between the two Territories. The object of each player is to Checkmate the opposing Empress which wins the battle. None of the Combatants can directly cross the River from one of the two Territories into the other Territory either by way of moving or capturing - the Combatant must first move to or capture on a position (bridge) on the River with their usual move or capturing move. The effect of this rule (called the rule on crossing the River) on each type of Combatant is discussed under the moves and capturing powers of the various Combatants. An Empress is identical to a General in Chinese Chess. She is confined to her Fortress and cannot move or capture outside of it. She can move to or capture on (within the Fortress) one position vertically forwards or vertically backwards or one position horizontally. An Empress must not remain under attack (check) if it is possible to escape the attack and she may not move into an attack, also no moves or capturing moves can be made by her own Combatants which cause her to be placed under attack. In accordance with ancient tradition of the River Territories, two Empresses may not face each other along an unoccupied file, as the two Generals may not in Chinese Chess. The rule on crossing the River has no direct effect on an Empress. A Guard is identical to a Guard in Chinese Chess. He is confined to his Fortress and cannot move or capture outside of it. He can move to or capture on (within the Fortress) one position diagonally forwards or diagonally backwards and so the total range for either Guard is five positions. The rule on crossing the River has no direct effect on a Guard. A Defender is identical to an Elephant in Chinese Chess. He is confined to his own Territory and his own nearside rank of the River and cannot move or capture outside of this - e.g. a Southern Territory Defender can eventually reach positions C1, G1, A3, E3, I3, C5 & G5. He can move to or capture on (within his range) two positions diagonally forwards or diagonally backwards provided the intervening position is unoccupied (he cannot jump over an occupied position). The total range of positions is seven for either Defender. Although two positions reachable by each Defender are on the River (C5 & G5 in the above example) they can move to or off and capture on or from these two positions in the same way as within a Territory and the rule on crossing the River has no direct effect on a Defender. A Knight is identical to a Knight in Western Chess and so differs from a Horse in Chinese Chess. He is not confined to any part of the board. He moves to and captures on any position that lies two positions vertically (forwards or backwards) or horizontally to him and one position laterally in relation to this. Any intervening Combatants have no effect on the move or capture. The length of a Knight's leap means that he cannot directly leap across the River which consists of two ranks and so a Knight can move and capture to the River from either Territory, can move and capture within the River itself or move and capture from the River to either Territory in the same way as within a Territory and the rule on crossing the River has no practical direct effect on a knight. 1. If a Siege Engine is situated on a position in either of the Territories then it can only move to or capture on a position within that same Territory or the River, i.e. it cannot move to or capture on a position in the other Territory. 2. If a Siege Engine is situated on a position on the River then it can move to or capture on a position in either Territory or on the River itself, i.e. the whole board. Whilst a Siege Engine stays situated on the River then, the possibilities of moving or capturing are not restricted. 1. If a Cannon is situated on a position in either of the Territories then it can only move to or capture on a position within that same Territory or the River, i.e. it cannot move to or capture on a position in the other Territory. If capturing, it makes no difference to the rules of capturing where the screen is situated (same Territory or River) provided the Combatant being captured is situated in the same Territory or the River. 2. If a Cannon is situated on a position on the River then it can move to or capture on a position in either Territory or on the River itself, i.e. the whole board. Whilst a Cannon stays situated on the River then, the possibilities of moving or capturing are not restricted. If capturing, it makes no difference to the rules of capturing whether the screen is situated on the River or in a Territory. â€¢ Each Hawker carries with him a Hawk which is a trained hunting bird and will attack opposing Combatants situated in the opposing Territory. â€¢ Each Empress has instructed all her Hawkers to release their Hawks upon reaching the opposing Territory and so this happens automatically. â€¢ The Hawker releases his Hawk and retires from the battle and his Hawk is left by himself on the position that the Hawker was on. â€¢ The released Hawk can exercise his moving and capturing powers commencing on the next move. If a Hawker is captured before releasing his Hawk, the Hawk is also captured. A Hawk's moving and capturing powers cannot be used before he is released. The rule on crossing the River has no direct effect on a Hawker. A Hawk has the abbreviation NHK (Northern Territory Hawk) or SHK (Southern Territory Hawk). A Hawk differs much from his counterpart, a promoted Soldier, in Chinese Chess. A Hawk is confined to the opposing Territory, which is where he is released, and he cannot move or capture outside of this area. A Hawk can move along any path that is vertically forward, vertically backward or horizontal and land upon any unoccupied position along one of these paths regardless of any intervening Combatants - this moving ability is called flying. When capturing, however, a Hawk can only capture on one adjacent position that is vertically forward, vertically backward or horizontal i.e. a maximum of four possible positions. The rule on crossing the River has no direct effect on a Hawk. 1. Points are three for a win but only 1/2 for a draw. 2. The Southern Territory Combatants move first and then each side moves alternately. 3. The allowing of capturing on to the River from a Territory appears in contradiction to the rule in Dragon which does not allow capturing on to (when embarking) Trafalgar Ocean from a Kingdom. The circumstances are very different though since there are bridges on every position along the River and so access to the River can be forced, whereas access to Trafalgar Ocean is by passage on ships and, when on land, this cannot be forced of enemy ships or ships under the control of an enemy Force. 4. Retired Hawkers are removed from the board and placed with captured opposing Combatants whom they guard. If an abbreviation is required for retired Hawkers they are: NH (ret) - Northern Territory retired Hawker and SH (ret) - Southern Territory retired Hawker. 5. 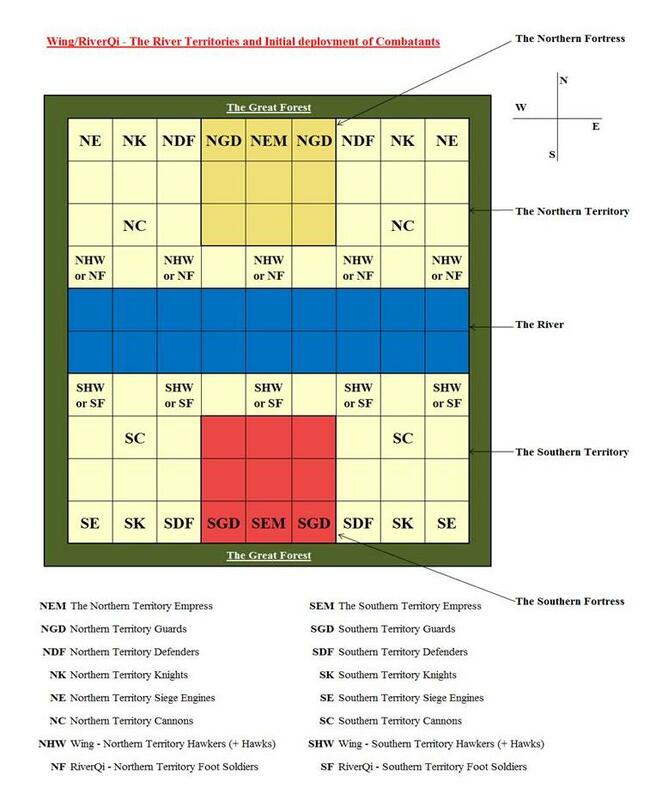 The usual colours are dark red for the Southern Territory Combatants and dark yellow for the Northern Territory Combatants though other colours can be used if of good contrast. Combatants (pieces) are, as with all Tiger's-Eye board games, three dimensional and are not disc form. 6. The "chasing rules" of Chinese Chess do not apply. 7. Draws are based on the rules for Western Chess and include Stalemate and Threefold repetition of moves. 8. Perpetual check is allowed. 9. Players should state "check" if the opposing Empress is under attack, though this is not compulsory. 10. All captures result in the capturing piece occupying the position the captured piece was on. 1. The players are not named but the sides are called the same as for Wing, i.e. the Northern Territory Combatants and the Southern Territory Combatants. Clocks are single countdown. 2. The settings are the same. 3. The board is the same i.e. the "River Territories" board. 4. The initial deployment is the same except there are Foot Soldiers instead of Hawkers and Hawks, as shown on the diagram of the board. The notes to the diagram also apply. 5. Unlike Wing, reasons for and details about the dispute between the Territories are not known. 6. The objective is to Checkmate the opposing Empress and this wins the battle. 7. The rule on crossing the River is the same. 8. The moves and capturing powers of the Combatants are identical to that described in Wing for the following: Empress, Guard, Defender, Knight, Siege Engine and Cannon. 9. As already stated, the Hawkers & Hawks are replaced by Foot Soldiers and their powers of movement, capture and promotion are virtually identical to Soldiers in Chinese Chess and are: A Foot Soldier moves to or captures on one position vertically forwards (the same as a Soldier in Chinese Chess) until he has reached the opposing Territory on his seventh rank when he is automatically promoted and he can now move to or capture on one position horizontally as well as one position vertically forwards (the same as a promoted Soldier in Chinese Chess). A promoted Foot Soldier is called an advanced Foot Soldier (abbreviations NFa - Northern Territory advanced Foot Soldier and SFa - Southern Territory advanced Foot Soldier). His new powers of moving and capturing can be exercised commencing on the move following the promotion. Should an advanced Foot Soldier reach his last rank of the board he can only move to or capture on one position horizontally and so stays on his last rank (the same as a promoted Soldier in Chinese Chess). It can be seen that the only difference between a Foot Soldier and his counterpart, a Soldier, in Chinese Chess is that in RiverQi promotion is on the seventh rank whereas in Chinese Chess promotion is on the sixth rank. The rule on crossing the River has no direct effect on either a Foot Soldier or an advanced Foot Soldier. 10. The General rules & notes given under Wing apply to RiverQi except: In RiverQi there are two points for a win and one for a draw, and the note about retired Hawkers does not apply. 11. Qi in RiverQi is pronounced as in the English word key. 1. The board is the "River Territories" board and the deployment for both sides is the "Xiangqi set-up". 2. The rule on crossing the River applies as usual to the RiverQi pieces but not the Chinese Chess pieces. 3. The sides are called North and South where South moves first. 4. The names of the RiverQi pieces are their usual RiverQi names - see note 5. on Foot Soldiers/Soldiers. The names of the Chinese Chess pieces are: Empress (instead of General), Guard, Elephant, Horse, Chariot, Catapult (rather than Cannon) - also see note 5.on Foot Soldiers/Soldiers. The powers of movement and capture for all these pieces are described: for RiverQi (under Wing/RiverQi), and the Chinese Chess pieces are as standard. The differences between the two sides being the blockable Horse of Chinese Chess and the rule on Crossing the river. 5. The players can both agree that promotion of Foot Soldiers/Soldiers takes place on the seventh rank or the sixth rank, but promotion must be on the same rank for both sides. If there is no agreement then promotion takes place on the seventh rank for both sides. Where promotion takes place on the seventh rank then the names are Foot Soldier before promotion and advanced Foot Soldier after promotion. Where promotion takes place on the sixth rank then the names are Soldier before promotion and promoted Soldier after promotion - all their powers of movement and capture are standard as for Chinese Chess and are described under RiverQi. 7. Draws are based on the rules for Western Chess and include Stalemate and Threefold repetition of moves. Perpetual check is allowed. 8. The game should state which side has which pieces by saying that "the Chariots are with South (or North)". The game should also state that "Promotion is on the seventh (or sixth) rank". 9. Clocks are single countdown.